Patchouli (Pogostemon cablin): growing, planting, caring. A strong-scented cousin of the mint. Pogostemon cablin - Patchouli - is a species of plant in the family Lamiaceae native to tropical regions of Asia. It is a bushy plant with erect stems reaching around 75 centimetres (2.5 ft) in height and bearing small, pale pink-white flowers. 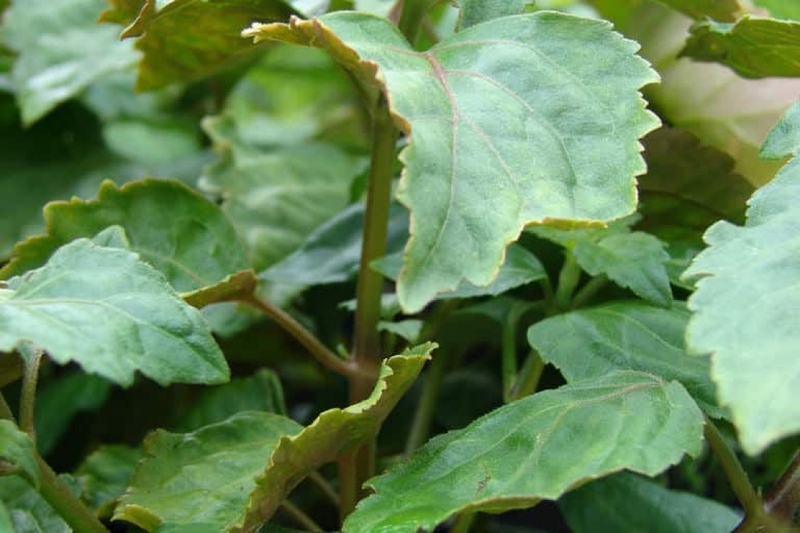 Patchouli should be treated as a very tender perennial or an annual, and better grown as a houseplant in cold regions. It thrives in hot weather but not direct sunlight. Easy, if you rub the leaves and he smells like patchouli, it's him! Otherwise, it resembles a perennial branched shrub with alternating thick toothed leaves and reddish hairy stems. Your patchouli can reach 60 cm in all directions, so plan for space, such as a pot of 40 cm in diameter for example. Our advice is to plant it in a pot that you can shelter from the winter cold. Before planting, open the root ball a bit to break the outer roots that form circles. If the root ball has dried, baste it for 30 minutes. Fill the pot halfway with compost or ordinary compost, arrange your plant, and fill the tray to the level of the collar of your patchouli. Tamp well, then water copiously. Place the pot in the light, warm. Small advice to make your patchouli more elegant: puta layer of mulching. You can plant your patchouli in the open soil, but in this case it will be necessary to put it back in pot to shelter it in the winter - except if you are in a region where it never freezes. Plant it in semi shade or in direct sunlight, in ordinary soil, like in pots. In pots, water copiously once or twice a week during growth, and less often in winter. In open soil, water during the summer period without excess, once a week if it is very dry, rather in the morning, sparing the leaves. Patchouli freezes at -5 ° C, so shelter it in a room where it does not freeze. The warm days come back? You can place your patchouli outside after May 15 in the north, earlier in the afternoon. Place it in a sunny spot. If you plant it in open soil, consider giving it some compost at the plantation! After two years your patchouli is cramped in its pot, so take it out, remove some of the soil by scraping the roots and replace it with new compost or potting soil. If you have a bigger pot, install it in, it will be more comfortable. If potted, add a little compost on the top of the soil every year.